Need the turbo drain tube from an S14. Also a set of(all 4) 15" wheels to suit an XF falcon. not too fussy about the look PM me!!!! Evo Brembo adapter plate? (edit) + BMC to suit? I use a BM50 from a 300zx non abs model, a non abs S14 booster with Skyline rear calipers and the brembo fronts. Pagid RS 4-2's all round. The brake feel is awesome and balance is good too. Took me a lot of master cylinders and time to work out this combo, but it give the best feel and heaps of brakes. These pads wear the discs out faster than the pad though . Car is an S14 btw. upper limits of 2860 on sr20? 230 @ 16psi here, solid all the way to redline at 7200. Poncams (256 11.5mm), all supporting mods. 98 pump. Has more in it, but got them to stop at 230 so I could flog it all day and not care. The CAS (Cam btw, no Crank sensor on an SR20) is probably faulty. Its known to happen. Only the CAS and the settings in the ECU affect timing. well if you can't get it rego'd..... Track Car! Results are in. We made the top four. Thanks to those who voted. I assume Gravs will be the backup? 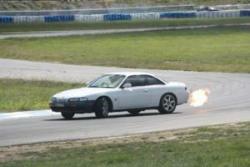 My S14 has major issues with fuel surge when drifting, anything below 1/2 would surge. Therefore I put in a surge tank with an external pump and that solved the problem. Thats the only reason I put one in. My setup makes 230rwkw. Don't bother with a surge tank unless you need it. It a pain to setup (and drain), but they do work very well.